This bundle is no longer offered. It has been replaced by a coupon code to receive the discount. Please add the eTapestry Payment Plugin and the eTapestry Mapping Plugin to your cart and use coupon code ‘bundle’. Process payments, add gifts, contact entries or just new Accounts through your eTapestry account with two eTapestry API Plugins and Gravity Forms! This is two plugins in one: A payment gateway that uses your eTapestry/Blackbaud processor and a plugin that does not process payments but sends info to your etapestry account through their etapestry API. Install your plugins and enter Serial Keys and your eTapestry api login and password credentials in the Forms>Settings>eTapestry Payment and eTapestry Mapping pages. Then create a new feed in each form you’d like to integrate. 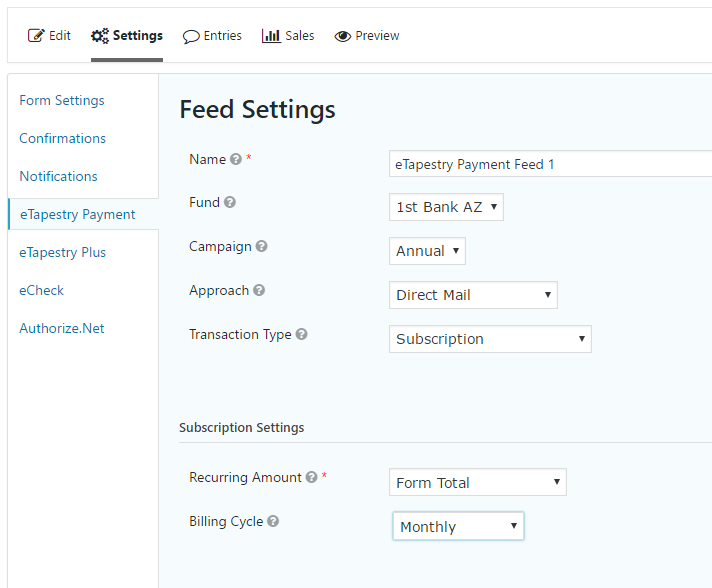 Select your Fund(required for payment plugin or for recording a gift in Mapping), Campaign and or Approach and Letter, and map other form fields to the plugin like address, email and your eTapesry User Defined Fields. Set if you want to allow for an email only match when searching for existing accounts. For subscriptions you can choose manual or automatic processing (if auto is set up on your eTapestry account). These plugins integrate with your eTapestry account to pull your information into the settings fields so you can just select parameters (like your Fund) just like you were on eTapestry. Please make sure you have asked for eTapestry API access as it isn’t automatic! If you do not wish to use your etapestry payment processor, please consider the eTapestry Mapping Plugin that only adds gifts, accounts and or contact/journal entries. It works with other payment processors or no payment at all.